It's only Tuesday of 'royal wedding week' and the head-spinning amount of coverage about the royal wedding has the less than fascinated crying uncle. I happen to reside happily in the other camp. I simply can't get enough. I started the week off watching the footage of the wedding of Prince Charles and Diana on TLC Sunday night and found myself tearing up at the thought of how badly the 'fairy tale' ended. Without going all Barbara Cartland about it (who, in case you didn't know, was Diana's step grandmother), seeing the 19 year-old Diana Spencer walking down the aisle on the arm of her father, the ailing Lord Spencer while her erstwhile mother, Frances Shand Kydd (the 'bolter' who left Diana and her siblings and ran off with a wallpaper millionaire)stood in the background, left me feeling wistful for what might have been. Not for the faux fairytale marriage which was doomed from the start, but for how Diana, had she not found herself in Paris on that August night in 1997, might have gone on to live her life as a much wiser single woman with a strong, loving relationship with her two sons and been in the church on this coming Friday to see her oldest son get to marry for love, not duty. As she did when she was alive, Diana is still the driving force behind our obsession with the British royal family. The major difference now is that on the eve of the second 'Wedding of the Century' in the last thirty years, the Windsors have embraced the 24/7 media culture (of which Diana is the patron saint) to such an extent that they are purveyors of their own news 'packages' and B-roll on the official royal website. They have at least created the impression that they welcome the obsessive coverage. How brilliant is this week's cover of The New Yorker? What strikes me about it all is that regardless of the subject matter, the spectre of Diana hangs over everything. 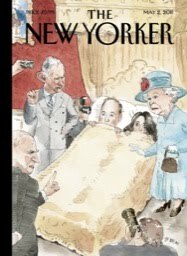 Let's face it, everyone -- the reporters that cover the royals (particularly those in the UK who have been left to drum up stories about Charles and the terminally frumpy Camilla), royal watchers and the royal family themselves -- are hoping lightening will strike twice. Since Diana's death there has been something of a vacuum with the royals. There are no stars. William and Harry are popular, but not like their mother. (Although, Harry's stock is on the rise now that he has been christened the world's most eligible bachelor) Diana was a superstar. It seems that the royal family has come to recognize that to keep their glided train on the tracks, they need some real stars. They are banking on William and Kate (Killiam? Wate?) to grow into their parts in this tightly scripted reality series. For now, it seems William and Kate (who has actually been instructed by royal insiders by watching video of Diana), are willing to play along -- but for how long? He's done his best at putting it in the deepest recesses of his mind for the moment, but William believes -- and always will -- that the media played a key role in his mother's death. One of the reasons he waited so long to propose to Kate was because he was so reluctant to subject her to the same scrutiny that his mother faced. Kate is reportedly much more deferential than Diana, but she's not officially joined 'The Firm' yet. Remember, as Tina Brown once put it, Diana became 'the mouse that roared.' I suspect as Kate settles into her role as the new princess (and rest assured, she's getting that title) and comes to realize how important she is in the scheme of things, she'll be less inclined to embrace her role as show pony. With the added confidence of knowing she is married to a man who truly loves her, she has more power than Diana had going in. What she and William do with it remains to be seen.